When reality set In that I was going to be heading to China with Semester at Sea, I honestly wasn’t so sure what I would be doing in China. It was never a place I’d see myself going to – but here I was on my way! I wanted to get away from the hustle and bustle, the pollution I have heard so much about, and while I wanted to see the Great Wall, I felt I wanted an experience a little more diverse, something I could relate to…something I would fall in love with. 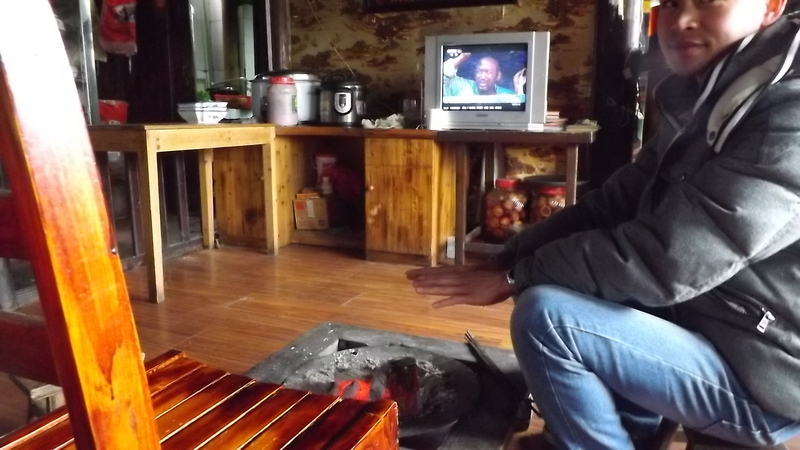 As such, I set my heart on going to Guilin, China way up in the mountains. Why? Well, initially I was simply interested in seeing the great wonders of Guilin: Reed Flute Cave and Elephant Trunk Hill. I am a nature junky, I love caves, I love to climb and hike, so I felt this would be the best choice for me. Little did I know, Guilin held something so much more precious, something I know will stick with me forever. We did visit the caves and the hill I mentioned, and I loved every second of it. While extremely touristy, I tried to see past that as I placed the palm of my hands inside Reed Flute Cave and tried to absorb the 180 million year old phenomenon it is. 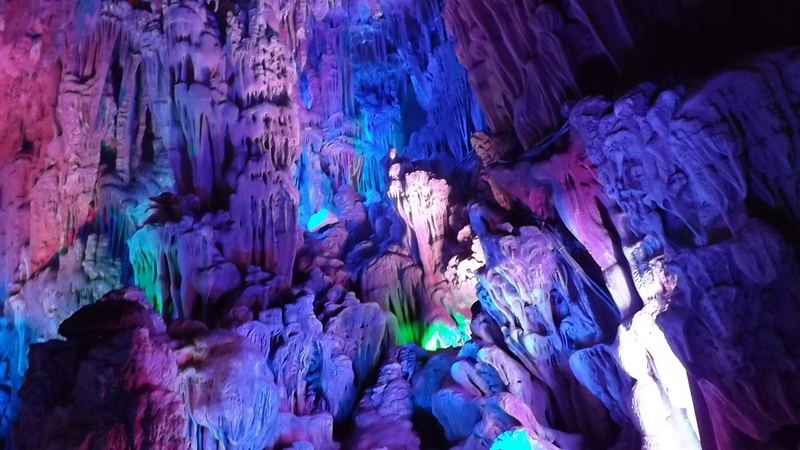 The cave was decked out in colorful lights, and although I would have preferred to see it in its natural state, the colors did give its amazing structure charm. This cave has seen so much – I wish it could speak because I’d have so many questions. Elephant Trunk Hill was just pretty to look at. A natural formation that resembles the trunk of an elephant, locals liked to dress up and take pictures in front of it. I wanted to touch it. 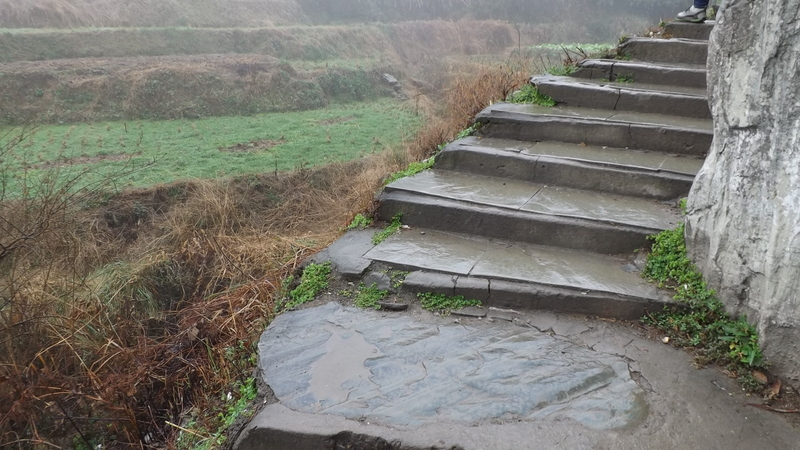 No matter Guilin was freezing, I wanted to cross the river and climb it. Eventually it was time to get on the bus, up the mountain, to board a second buss which continued up the mountain via a winding (and terrifying) road, and finally we excited to see countless stairs going up. It was hiking time! Through the freezing fog, we headed up the mountain. 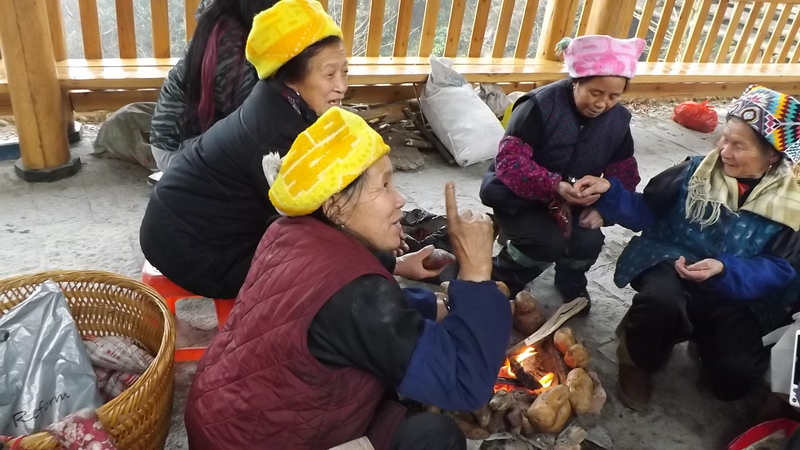 I saw tribes and villages, small schools, markets, woman selling taro roots cooked over an open fire. So many fire places everywhere! To keep warm I often bought these taros and munched on them – much like a potato, but somehow so much more satisfying. Completely engrossed with what I saw as I passed by locals, I didn’t even notice the view that was slowly becoming. Eventually, I looked up and I thought I’d fall off the mountain in pure shock. We were so high, in the fog, and in the distance I could see the amazing beauty Guilin brought. The mountains and land formations were other worldly – it was something I only ever saw in the movie Avatar, yet here I was, on planet earth, seeing what just didn’t look real. Any and all of life’s problems became so pointless staring into its vastness. 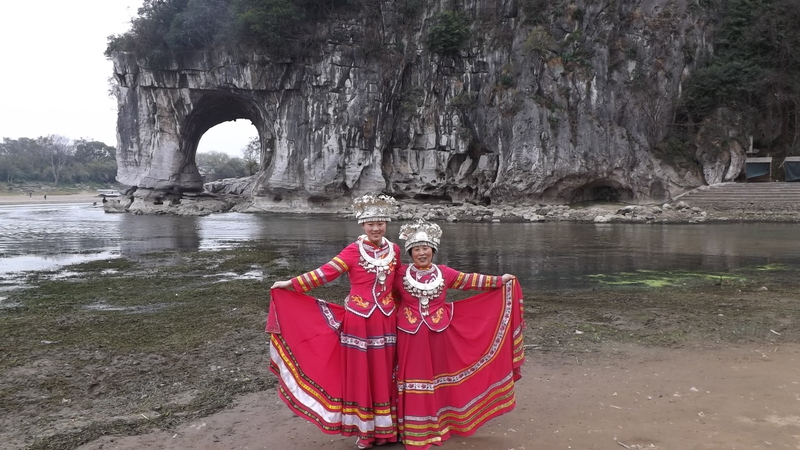 It was even greater the next day to board a river cruise on the Lijang River from Guilin to a small area known for its popular water show and, again, its surrounding hill and mountain formations. 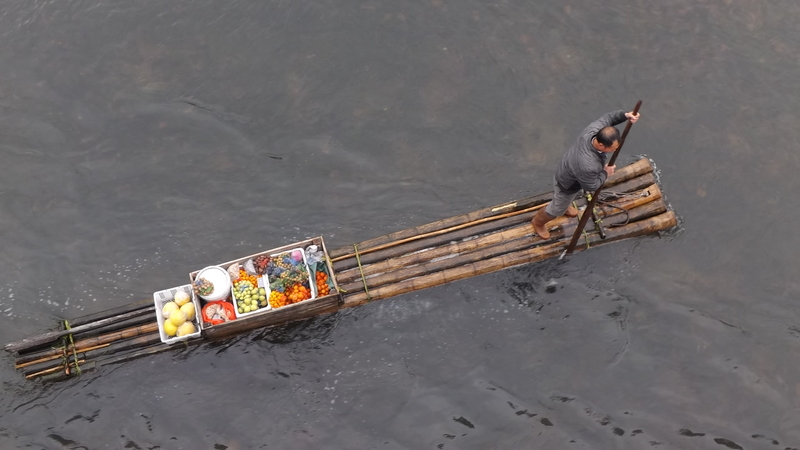 On the cruise we passed by mini floating markets where men on bamboo rafts sold fruits and fish on the water. 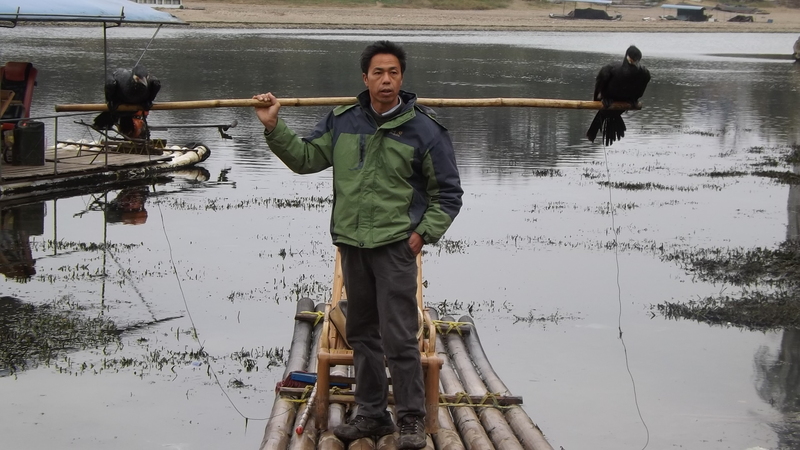 Alongside these men were their trustworthy companions: Cormorant birds! Beautiful creatures that are a part of the local farmer’s family, one can simply not go fishing without them! Eventually we made it to our destination: Yangshuo! Our hotel was in the heart of what the locals called “The largest market in the world” and that night we headed to something that left a print on me forever: The water show of Yangshou! You can only see such beauty here, and only here. You go to a place where there is a small clearing to see the river, and behind it are the amazing mountains and hills I keep mentioning. At night you head here, and the lights are all off: and then it begins. Women come out dressed in lights while floating on rafts, sing their heart out to tell a story of their tribes and love for the land. Huge spot lights turn on and brighten the beautiful hills and mountains, so it is all you see. I wish I could describe to you such a sight to see, but you can only experience it if you go for yourself! 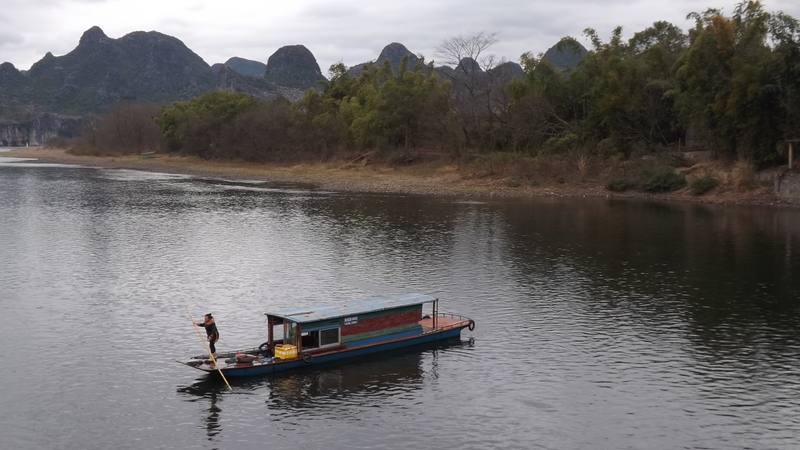 So please do, Head to Guilin, China – you will love the culture and history, and coupled with the sights to see it is impossible not to fall in love with. Go when it’s warm, although the freezing temperatures had a special charm.